On this day in 1789, the first American novel, The Power of Sympathy or the Triumph of Nature Founded in Truth, is printed in Boston, Massachusetts. 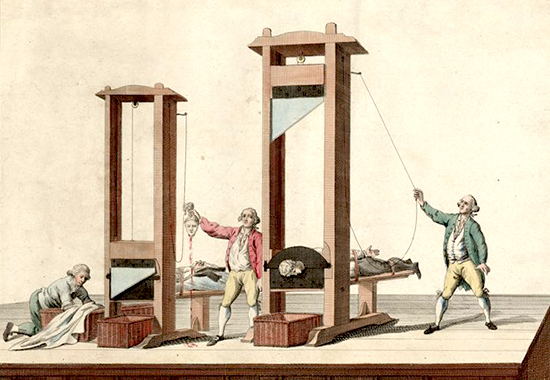 On this day in 1793, after being found guilty of treason by the French Convention, Louis XVI of France is executed by guillotine. On this day in 1908, New York City passes the Sullivan Ordinance, making it illegal for women to smoke in public, only to have the measure vetoed by the mayor. On this day in 1915, Kiwanis International is founded in Detroit, Michigan. On this day in 1948, the Flag of Quebec is adopted and flown for the first time over the National Assembly of Quebec. The day is marked annually as Quebec Flag Day. On this day in 1950, American lawyer and government official Alger Hiss is convicted of perjury. On this day in 1961, 435 workers are buried alive when a mine in Coalbrook, Free State collapses. On this day in 1968, the Battle of Khe Sanh - one of the most publicized and controversial battles of the war – begins. On this day in 1968, a B-52 bomber crashes near Thule Air Base, contaminating the area after its nuclear payload ruptures. One of the four bombs remains unaccounted for after the cleanup operation is complete. On this day in 1976, commercial service of Concorde begins with the London-Bahrain and Paris-Rio routes. On this day in 1977, President Jimmy Carter pardons nearly all American Vietnam War draft evaders, some of whom had emigrated to Canada. On this day in 1981, production of the iconic DeLorean DMC-12 sports car begins in Dunmurry, Northern Ireland. On this day in 1997, the U.S. House of Representatives votes 395–28 to reprimand Newt Gingrich for ethics violations, making him the first Speaker of the House to be so disciplined. On this day in 1999, one of the largest drug busts in American history takes place when the Coast Guard intercepts a ship with over nearly FIVE TONS of cocaine on board. Any connection with the DeLorean story above is purely coincidental.